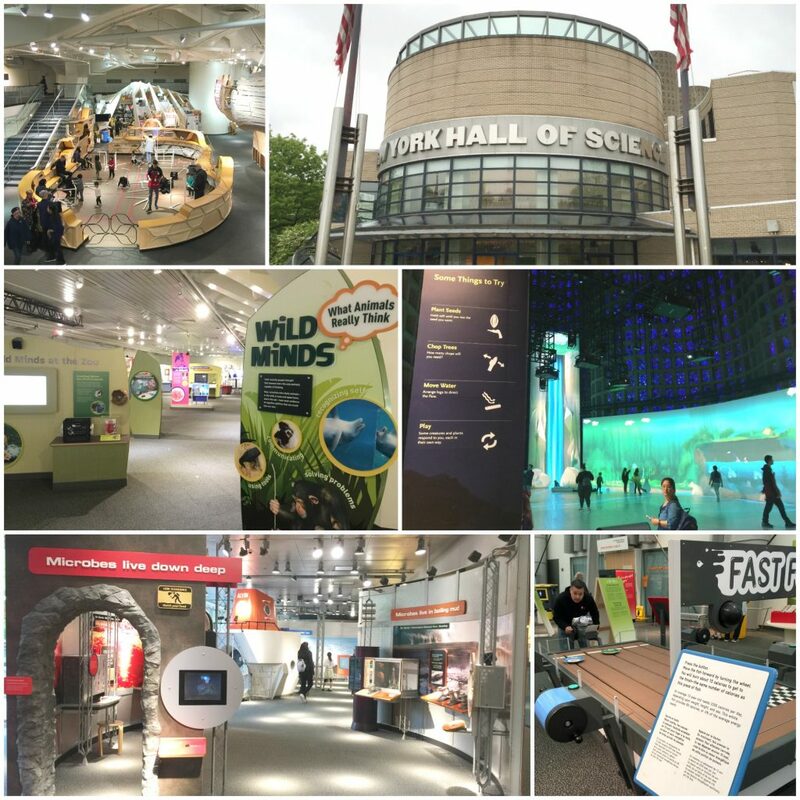 I was privileged to travel recently to the United States to attend Interactivity, the annual International Children’s Museum conference, this year called “Open Source Play: Sharing the Creative Code”. And not to waste a minute in such a rich learning environment, in a country where museums, galleries, playscapes and culture intertwine to create inspirational moments 24 hours a day, 7 days a week, I took the opportunity to immerse myself in these places in New York and St Louis, Missouri. So first, here’s my “New York playscapes in 4 days”! New York City is the home of some of America’s most enthralling cultural institutions; museums, galleries, theatres, statues and sculptures and streetscapes. There was a very real possibility for sensory overload. But I focused on interactive museums, including children’s museums. And I wasn’t disappointed. Interactivity is what it is all about. Although stunning dioramas and ‘stand, look and learn’ style exhibits still play a part in a modern museum, days of this style of experience are numbered. Contemporary ideas and pedagogies support experiences that are more immersive than traditional museums, and I took 47 pages of notes just recording the basics of how things are done over there. After wandering through the 9/11 Memorial Garden, the Pumphouse park and some more important landmarks in downtown New York, I headed to the Lower East Side and the Tenement Museum. It tells the stories of the immigrants of New York, their journey side by side in cramped tenement housing on the Lower East Side, and how they shaped the New York City of today, and continue to do so. It’s a museum that tells stories of ordinary people who built an extraordinary country. Walking through New York is one big industrial architectural fieldtrip. I spent hours talking to locals about specific wrought iron details, investigating concrete formwork and pondering the design and function of old structures. All the while, the Boilerhouse adaptive reuse was in the forefront of my mind; how could we best capture the essence of the building itself, the stories imbued in its nooks and crannies, the significance of a heating contraption that enabled people to inhabit Armidale during chilly winters in order to learn? My meanderings took me to MoMaths, the National Museum of Mathematics. I made the mistake of visiting this place too late in the day however. I had only just over an hour, which was nowhere near enough time to take in all the wonderfully interactive maths problems. But I did discover spun chairs, digital mazes and fractal human trees. Game changer. Expect to be balancing on spun chairs at the Armidale markets in the mall some time soon! One place that had been recommended to me by many people was the McKittrick Hotel, a hotel that, in 1939 was intended to New York’s most decadent luxury hotel of its time. But just after WWII broke out it was locked, permanently sealed from the public. Now it is the home of Sleep No More, an immersive theatrical experience, and a date with a film noir version of Shakespeare. I was unable to get tickets to this event (sad face), but was able to dine on the rooftop, and learn more about the history of its refurbishment and eclectic style. There were many places, including this one that used theatre to immerse guests in a time, a place, or an idea. Inspirational to say the least. I made my way to the Highline after dinner at Gallow Green on the McKittrick rooftop. It’s a public parkway reclaimed from an old freight railway that creeps, at height, from Gansevoort St in the Meatpacking District to West 34th Street at its northern end. It was late afternoon, and the sun’s reflection warmed the surfaces of tall buildings that surrounded the green parkway. 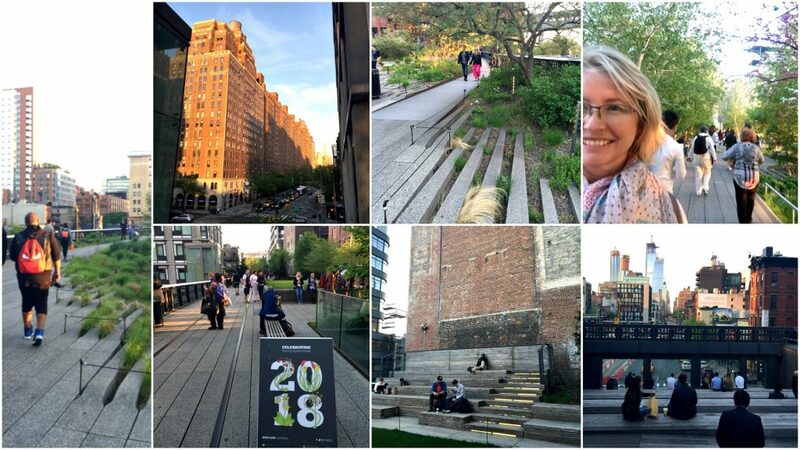 Spring’s bounty kept smiles on New Yorkers’ faces, and there was such a carefree and relaxed atmosphere as I wandered through beautiful plantings, artwork and repurposes rail sleepers and tracks. Such a great example of an adaptive reuse project, and the tenacity of a team of passionate and dedicated New Yorkers determined to revive this trail. A good reminder to never give up on a dream. Day 2 was focused in and around Brooklyn, and started out with a walk around the waterfront of Dumbo. Uber cool Dumbo (short for Down Under the Manhattan Bridge Overpass) is known for its 19th and early 20th Century industrial and warehouse buildings, most of which have been redeveloped into residential and commercial spaces alongside parkland and with the roar of the Brooklyn Bridge trains overhead. In this hustle is SPARK, a kids playspace owned by the Brooklyn Children’s Museum, and I spent some time with Victoria, the Director, talking about the nuances of the changing demographics and the rise of nannies in the area, and providing opportunities for stimulating play in a noisy, industrial, but hip and cool urban landscape. The Brooklyn Children’s Museum highlights how important it is to represent your local environment, demographics and values. It is a truly multicultural museum, with experiences reflecting the diversity of people of Brooklyn. Their greenhouse was a drawcard for me, and I spent hours watching how families interacted with one another in active and stimulating exhibits. A collaboration between an artists and the museum resulted in the Block Party, a modern funky take on a New York City street party, complete with wall graffiti, boomboxes and fabulous colours. Back to Manhattan on Day 3, and to the Upper West Side. The Children’s Museum of Manhattan is a 5 storey play extravaganza, with galleries of experiences on every floor. There were fantastic parent resources on the walls and in and around the play structures, reminding parents of the benefits of specific play, or prompting the use of diverse and stimulating language. It was also a good way to explore how children’s museums integrate sponsored experiences; the Dora the Explorer room was one of the most popular locations in the museum! But my two highlights would have to be the Royal Flush – a toilet that talks to you about the consistency of number 2’s!!! And the Dance room – chockers with all things music and dance, I discovered Spoonerboards, that will definitely join spun chairs in the Armidale mall! Wow – the American Museum of Natural History. What a phenomenal celebration of life. Six hours allowed me to explore about a quarter of the museum, and visit OUR SENSES and UNSEEN OCEANS, both special exhibitions within the museum proper. I was particularly interested in Our Senses because of the focus on designing experiences in the Boilerhouse to articulate benefits for our 7 senses, 6 dominant movement patterns and 10 C’s. I was also mesmerised with the artistry and attention to detail of the old school dioramas of various environments. You could convince yourself you were actually on the plains hunting bison…. Central Park was a beautiful next stop, and I was reminded how important the changing seasons are for invigorating people in urban areas. Blossoms, sun, blue skies and scampering squirrels combined to create the perfect afternoon in Central Park for locals and tourists alike. I was interested in observing and eavesdropping here; observing how people play in this iconic open space, and eavesdropping on their interactions about the park. I learnt a lot…. New York City Hall of Science! My last institution to visit before I flew south to the Children’s Museum Conference. It was opened in 1964 and evolved with the changing face and understanding of science, education and communication. I could see where the building has been adapted, modified and extended to accommodate the growing thirst for knowledge and inspiration in science across all ages. It was a mix of more traditional science centre ‘stations’ designed to teach you something specific, and more ‘design, make, play’ style galleries. The latter was where the action was, and where I observe multigenerational interaction and engagement in self-directed play and investigation. It’s worth checking out Connected Worlds if you get a chance. A stop in Williamsburg was essential – it is where the transformation of the Domino Sugar Factory is underway on the waterfront. Similar to Dumbo, Williamsburg is full of industrial and warehouse buildings that are being renewed by a generation of recyclers, upcyclers and sustainability gurus. In the shadow of the Domino Sugar Factory’s burnt out brickwork was a community garden and skate park; an oasis in the concrete jungle, and with a great view of Manhattan to boot! To say I was inspired would be an understatement. I immersed myself in the world we are trying to create with the Boilerhouse Discovery Space. I played with children of all nationalities and explored new technologies and environments with wide eyed wonder and the curiosity of an innocent Australian! I have stashed all the minute details away ready for them to emerge as design of the Boilerhouse progresses. I’m looking forward to working with bright minds and curious people on this project. You can join us now by having a say on our community consultation survey.